With so many varieties of pallet racking, how do you choose the right pallet racking for your situation? Global Industrial offer multi-level pallet racking systems to hold any type of pallets (known as ‘skids’ in some areas). There are various types including double deep racking, drive-in pallet racking, push-back and pallet flow. We also stock an extensive range of selective pallet racking. Roll-formed pallet racking is perhaps the most common form, with its simple clip-in configuration. This style of pallet racking allows shelving levels to be readily adjusted to suit the different pallet rack requirements. 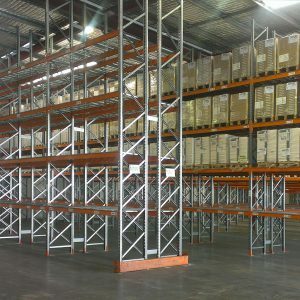 Global Industrial offers a large selection of second-hand pallet racking. All pallet racking is thoroughly inspected before purchase and before resale to ensure there is no structural damage to the frames or beams. To keep stock, and people safe or you just need to utilise the racking in a slightly different manner you may need additional accessories to your pallet racking. Global Industrial has all the pallet racking accessories you could need, including vertical arm dividers, hose hangers, coil rack holders, cable racking holders, fork entry bars, front to back supports (FTB’s), pallet support bars, mesh backing and containment systems, mesh decking, upright protectors, steel mesh cages, safety signage and more. Steel mesh containment panels for pallet racking can help to protect personnel by lining racks along a designated walkway. They can also deter theft by burglary or robbery by way of creating a bonded area. It is typically constructed of high-voltage-welded steel mesh that has been zinc-plated and attached to the pallet racking structure. Steel mesh can be retrofitted to just about any pallet racking system available. Containment panels for pallet racking can be used to protect high-value items; many organisations only allow certain vetted employees or managers to gain access, while keeping the area under surveillance. Steel mesh also allows for the ease of locating stock in the pallet racking system and is less likely to allow mould and mildew to damage products (compared to closed cupboards). You may also consider a pallet racking mesh-back system. By installing a stand-off post and then lining with mesh panels, you will help to prevent objects falling into a designated walkway or high-traffic personnel area. Safety is imperative; custom netting containment systems can also be designed for pallet racks to provide a barrier between each pallet level. To minimise potential damage to pallet racking from a forklift, column protectors should be installed at any upright located at a gangway and aisle. 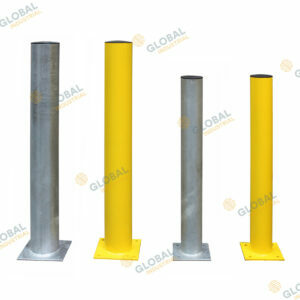 Column protectors are most often made from steel, and they are designed to protect the rack and absorb a certain amount of impact in the event of a collision. Workplace health and safety is serious business, so all steps must be taken to protect people around pallet racking. Signage is required on all pallet racking to be compliant with Worksafe Standards and Australian Standards AS 4084-2012. A load sign typically shows the basic layout of the pallet racking system to which it is attached, and the loads applicable to that rack. Pallet racking signs are available from Global Industrial and can be provided with load information if we have inspected the racking. 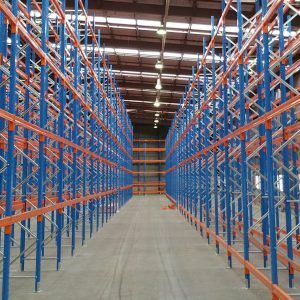 Selective pallet racking is the most common type of pallet racking, and most other types of racking are derived from the same parts used in this system. Typically installed in rows of 2-wide pallet bays, all pallets are easily accessible from the face of the pallet racking system. Levels can be added or removed where required to accommodate additional or oversized pallets. Selective pallet racking can be installed with almost any length beam and frame height, making it versatile for most applications. These racks are typically installed as a single row against a wall, or as a back-to-back system allowing both faces of the rack to be accessed. ‘Double Deep’ racking is set up much like selective racking but requires a special reach truck to access the back pallets (as the rack is double the depth). This type of racking follows a ‘first in, last out’ (FILO) policy: the front pallet needs to be moved to access the rear pallet. 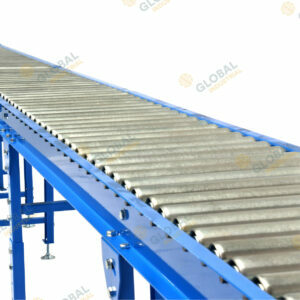 Pallet rails are used to guide the operator when accessing the back of the racking bay when loading/unloading pallets. If you want to employ a ‘first in, first out’ (FIFO) policy with inventory, you may opt for a ‘Drive Through’ pallet racking configuration. That means an entry and an exit for the fork truck. A ‘Drive-In’ rack system has only one entry/exit point, meaning that this configuration better suits a ‘last in, first out’ (LIFO) stock rotation system (not a good option for perishable goods!). A ‘Push Back’ pallet racking system or pallet flow system is designed around the idea of organising space by depth, rather than width for greater storage density. Using a slight incline, roller wheels and gravity to your advantage, you could store pallets as many as 6-deep on a Push Back system – and as deep as needed on a pallet flow system. Global Industrial offers new and pre-owned pallet racking solution to suit your requirements. We can also help maintain your existing pallet racking whether you need additional pallet racking beam supports or frames, pallet racking footplates, braces or row spacers, we can service all your pallet racking needs and help to ensure that the racking is kept up to the current standards ensure the safety in in any warehouse or retail space.